Asahi Beverage vending machines developed free wireless communication services “FREEMOBILE” adopted, Wi-free vending machines around the vending machines that featured Fi spots announced it will expand in 2012. Thus, around the same vending machine (50-meter radius around a vending machine) In, Wi-speed Internet connection to be available free of charge by all terminals supporting Wi-Fi. The establishment of the first year goal of 1,000, which revolves around the five areas of central Kinki metropolitan area in Fukuoka, Sendai, plans to expand nationwide gradually. 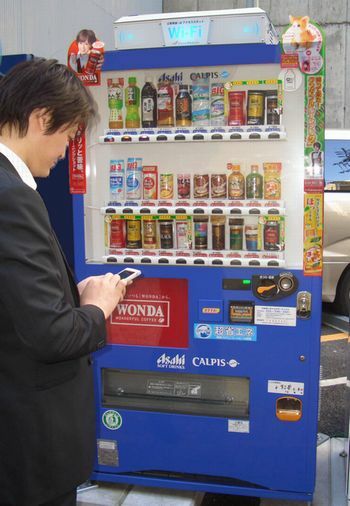 In addition to the vending machine function as a Wi-Fi spots, including product information, travel information and local shopping centers, tourist information, you can place a vending machine content in response to the installation site.